The Expansion Module A Ring of Hills is now back in print as a COMPLETE GAME. With 13 scenarios Heroes of the Falklands feature the Argentine seizures of Stanley and South Georgia and all of the major land battles, from the British Paras’ costly but morale-boosting assaults on Darwin Hill and Goose Green, to the daring commando raid on Top Malo House, across East Falkland to the climatic battles for the ring of hills around Stanley. Two what-if scenarios depict Argentine opposition to the British landing at San Carlos and a last-ditch fight for control of Stanley. Put on your cold-weather combat gear and bring along a pair of night-vision goggles: the fate of the islands is at stake! 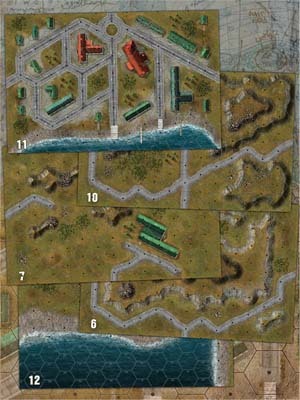 •	5 x Full Color Geomorphic 8.25 x 12.75 Maps. •	3 x Counter Sheets with over 335+ counters. •	1 x Full Color Core system manual featuring the latest v4.1 rules. 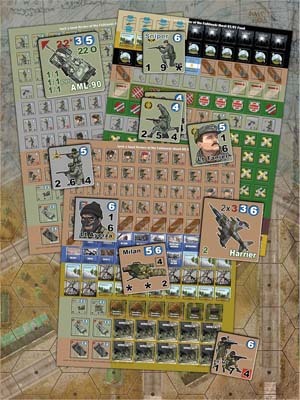 •	1 x Full Color Game Module rules, Examples of play with 12 Scenarios. •	3 x 11 x 17 Player Aid Cards. •	2 x 8 x 11 Player Aid Cards. •	1 x Heavy Duty box. •	2 x D6 Dice. •	1 x D8 Die.